Professor F.T. 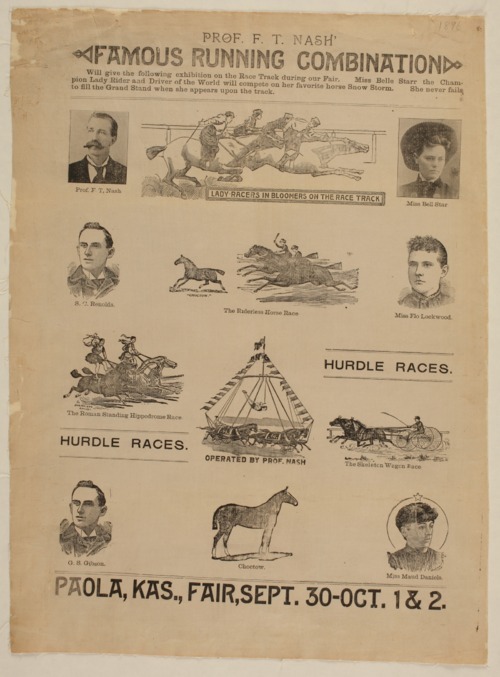 Nash holds an exhibition in Paola, Kansas, on horse racing featuring Bell Star, a championship female rider and driver. Also featured is the riderless horse race, the Roman standing hippodrome race, the skeleton wagon race and hurdle races. Other performers include S.C. Renolds, Flo Lockwood, G.S. Gibson, and Maud Daniels.